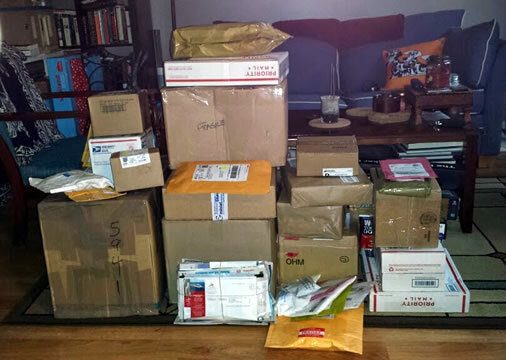 After displaying my slightly embarassing pics of the packages I’ve received over the holidays….I did try to be constructive with the loot I’ve received. Mostly to keep track of what I have in order to work on my first build of the new year….which I’m pretty excited to do. Yes, I still have the CC. Seriously, the whole egg carton into bricks is making me cringe. I’m still working on Dasha and Lena’s home, so please don’t yell at me. I haven’t forgotten it. But BK got me something over the holidays that’s making me dance in pure excitement. So most of you know that after building the ARC II, I ended up giving it to my mother to enjoy. And despite that generous gesture….I was missing that house. My dining room felt empty without it. 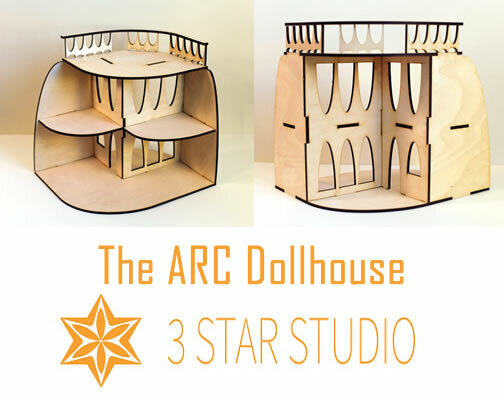 I guess BK picked up on my mood because on Christmas Day, he actually got me another ARC dollhouse kit from the ever talented team at 3StarStudios. My in-laws were definitely surprised at my reaction given I almost tackled my husband to the ground and gave him numerous hugs & kisses. Image used with permission by 3 Star Studio. Of course, the challenge was that I had to wait until BK and I returned home to do any work on the (yeah, I know not imaginative) ARC III. But in the meantime….I went online and began to order my supplies. Which all arrived (luckily) a week after I’ve opened the packages that were held during our absence. So now I’m ready…so ready to get to work! I have a plan…and I want to see if I can make it a reality! Oh sweet mother, I hope it doesn’t come to this! Holy crap, what happened to the last months of 2014? And how did we get to the end of January 2015??? I sure hope everyone had an awesome holiday season and a festive New Years. BK and I spent the holidays with his family up in Cape Cod. Even though we go there for the holidays, we always look forward to this trip every year since it’s a chance for us to spend time with BK’s parents and siblings. But the highlight of our trip was actually taking the ferry over to Martha’s Vineyard, and visiting BK’s beloved Grandma Ellie. Don’t get me wrong…we absolutely love the relaxing atmosphere the Vineyard provides. But seeing Grandma Ellie, hearing her stories, and just her way of wanting to spend time with you…she’s in every way the grandmother I had dreamed of having. Sadly, Grandma had been ill for the last couple of months, and on the Sunday after Christmas…she passed away in her sleep, in her lovely house in Martha’s Vineyard, surrounded by her ten kids. BK and I ended up extending our stay an extra week to be with family and for Grandma’s funeral. I still miss Grandma…but in a way, am glad that she passed in her own terms. And that I got to spend the last 7 years enjoying her company and her endless supply of advice and hugs. Sorry for the tangent post here…guess part of me is still coming to grips with what has happened. Granted, she was BK’s grandmother. But the fact she whole heartedly took me in and treated me like I was her own. It’s very…comforting. And another shot. 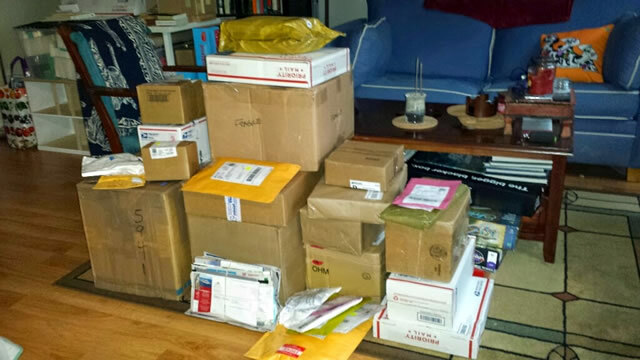 Again, this is just from the USPS. Yes, almost 90% of the packages were addressed to me. And I mean packages delivered by USPS, FedEx, and UPS. Just the trip to the post office alone…the clerk lent me one of their carts just so I can transport the boxes from the office counter to my car. Suffice to say, BK was initially amused, then worried, then amused when it came time for me to open the packages. “It’s like Christmas all over again,” he said as I began to tear open the boxes in my pajamas. All while screeching “it’s opening loot time!” every few minutes or so.